Cork Harbour was alive and humming today. 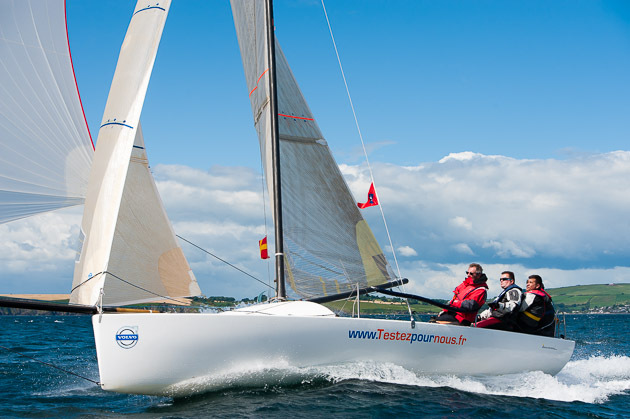 There was a nice 15/18 knot nor west breeze and PRO Peter Crowley in Sparetime, with Jack Roy keeping a watch on the pin end of the line which was set 2nm south east of Roches Point, left nowhere for the competitors to hide. However, even before the start there was drama when one of the 1720’s lost their mast and there was also a variety of broaches and other small incidents to liven up proceedings. The first fleet of the day, Fleet A, got away with just one individual recall and the competitor returned to restart. 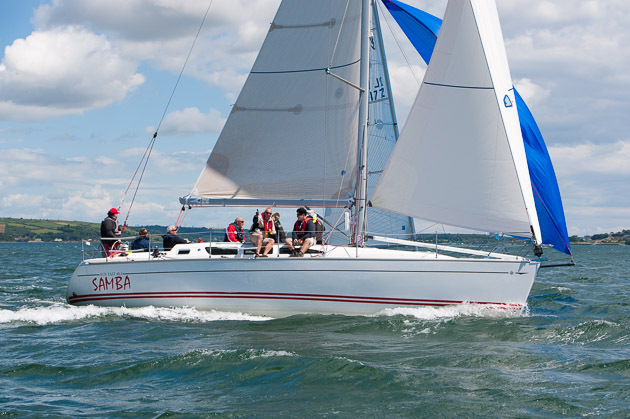 Marc Glimcher’s Catapult led off the start line, a position she was to hold for the nineteen mile course, followed by the Boyd/Dowling chartered, Quokka, followed by William Wester’sAntelope with Anthony O’Leary’s Antix to weather and then Andy Williams in Keronimo. 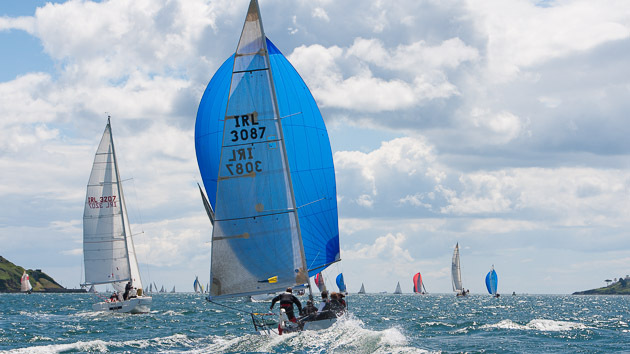 The fleet was sent on a course that took them to No. 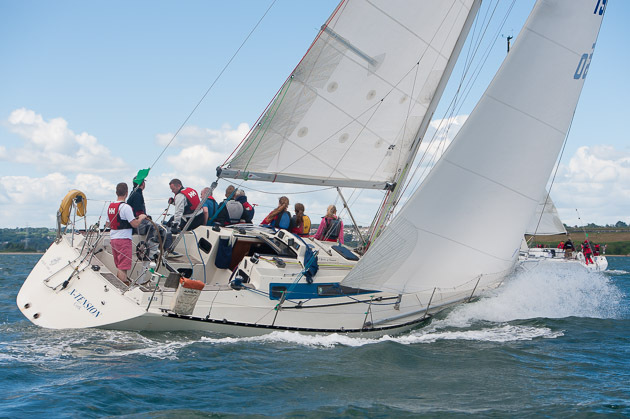 8 starboard and then course 30. A windshift then ensued that necessitated the changing of the pin end. 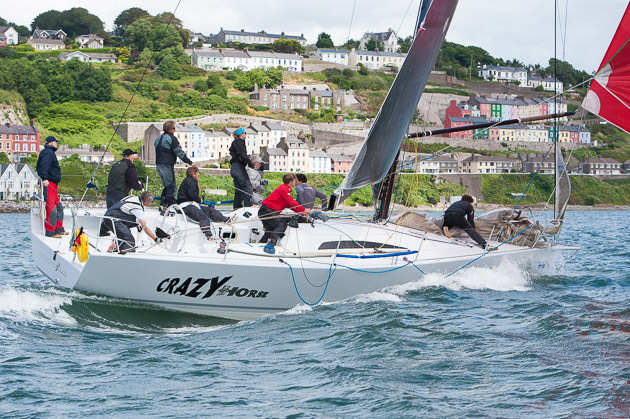 The race past Cobh that was held today is the best race for public viewing and lived up to expectations. The ‘Cathedral Puff’ as, forecast by your scribe yesterday, did in fact make its appearance and given that the wind was off the shore there was many a lull and then a gust resulting in swingboat sailing and keeping the crews on their toes. 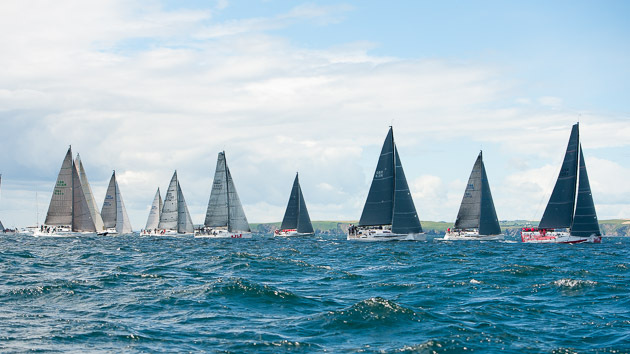 Shortly afterwards Fleets B and C arrived and it soon appeared that the entire harbour was filled with yachts going in all directions, upwind, off the wind, downwind. You name it they were going there, must have been great entertainment for the spectators. 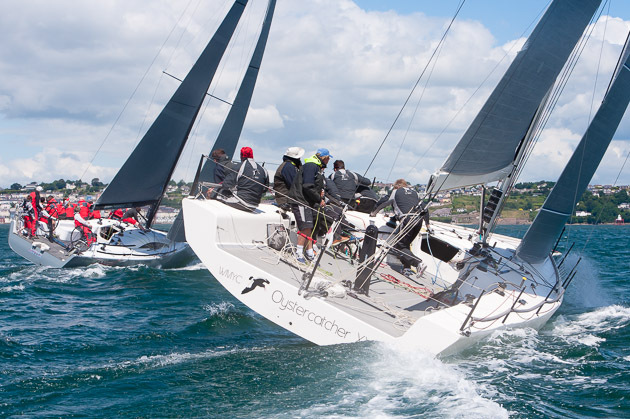 One interesting little piece of sailing that was intriguing was when Richard Matthews’ 42ft Oystercatcher towards the closing stages of the race with the wind astern, lifted her skirt and with her wide stern took off like a rocket and pulled up to within 50m of Catapult at the No. 5 turning mark but the distance was too short for her to pull ahead and she had to be content with second over the water with a mere 27 seconds separating them. 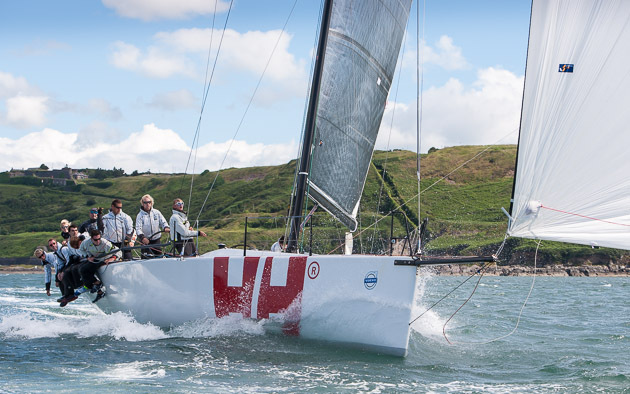 In Class Three the extremely competitive nine J109 fleet was included with Pat Kelly’s Storm, a former ICRA Champion, taking the victory on time correction, followed by Rob McConnell’s A35 Fool’s Gold and Paul O’Higgins Rockabill V who had taken line honours, in third place. 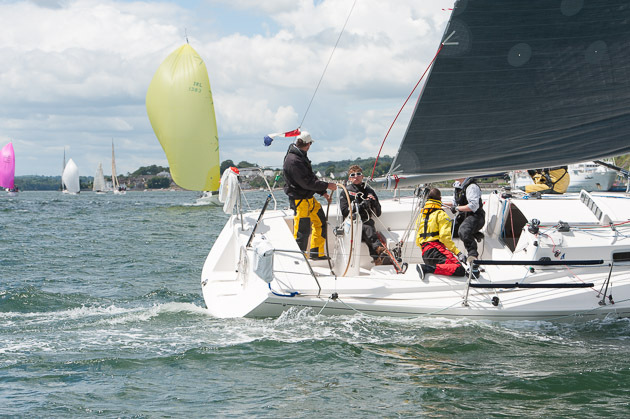 In Class Four the Deasy/Desmond/Ivers Bad Company took the win from Paul Tingle’s Alpaca while Tom Cunliffe in Insatiable from Falmouth took third. 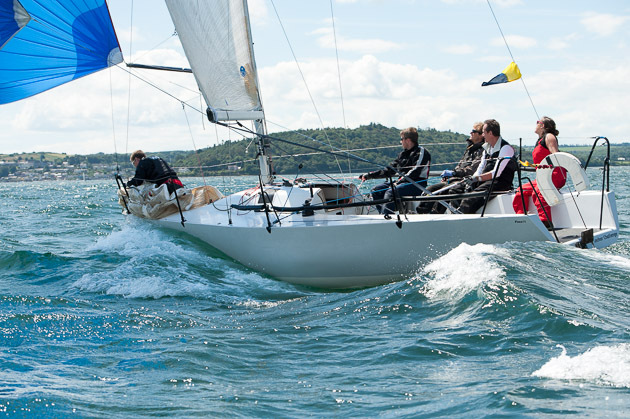 In Class Five the Jason and Dominic Losty’s Illes Piiuses, just fresh from her victory in the Corinthian Division of the Coutts Quarter Ton Cup took the win followed by Dave Lane and Sinead Enright’s new J24 YaGotta Wanna. 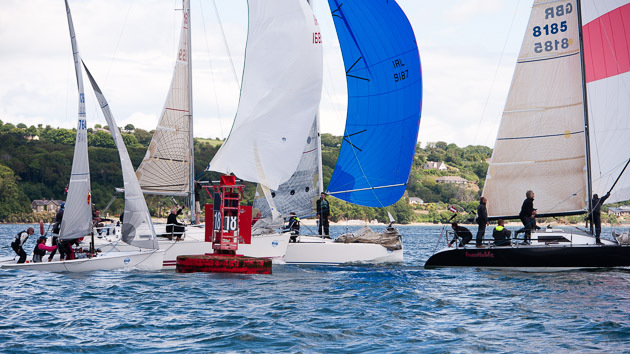 The competitors returned to Crosshaven having had an excellent day filled with plenty of breeze and sun and looking forward to a relaxing evening at Royal Cork and mulling over the day’s racing. 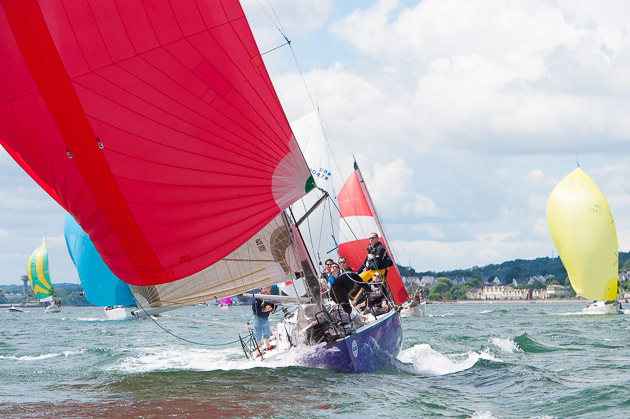 Should this weather continue they can look forward to a tremendous week of good sailing and intense competition on the many varied and excellent courses of Cork Harbour.